Applegarth Villa will tempt you with a diverse choice of dishes, prepared from the freshest local Cumbrian produce, with seasonal twists. A truly social setting for devoted food lovers and probably one of the best restaurants in Windermere with stunning views of the fells beyond. 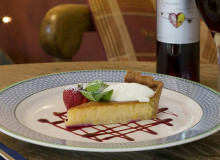 Head Chef, John Kelly uses only the finest ingredients, promoting were possible local produce. John will only be too pleased to discuss any special dietary requirements you may have and no matter what the season, there is always a large selection of gluten free dishes that don’t compromise on taste. 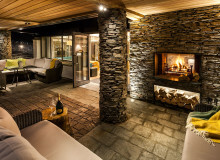 The restaurant takes the form of a conservatory which boasts stunning views towards the fells surrounding Windermere and is a place that can be enjoyed by those romantically inclined as well as those celebrating a special occasion. We would advise booking to avoid disappointment. In consideration of our many guests who join us to escape family and business pressures, we are unable to welcome children into the restaurant.